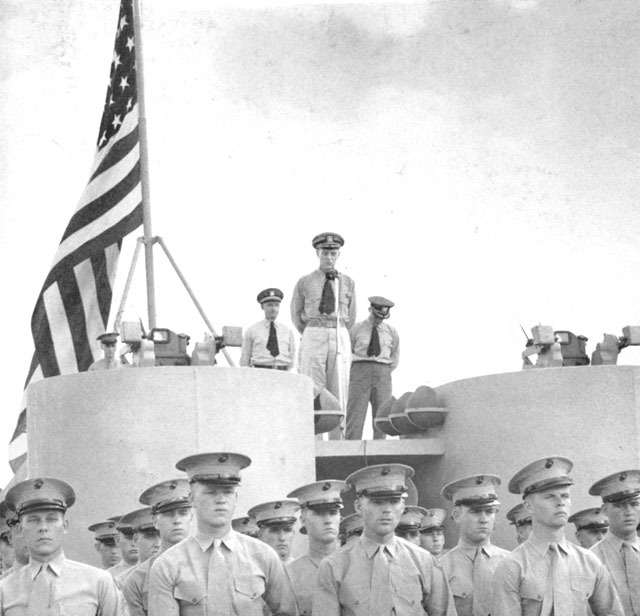 Finally, on 8 January 1945, the Alaska set out for Pearl Harbor. There Captain Kenneth H. Noble, of Cromwell, Connecticut, came on board to relieve Captain Fischler, who had been promoted to Rear Admiral, and Commander John E. Kirkpatrick, USNR, relieved Commander Hooper. the Gunnery Officer t who was ordered to the hospita1. After still more training in. various types of target practice and other drills, on 28 January the Alaska, in company with other ships, set forth for the western Pacific. Nine days later the group arrived at Ulithi Atoll and joined up with Task Group 58.5 consisting of fast carriers, battleships. other cruisers and, of course, destroyers. Leaving Ulithi on 10 February, the task group headed for the coast of Honshu, 1500 miles due north. This was to be the Alaska’s first opportunity to test out her reaction in the presence of the enemy.